This chapter describes how to run RCU from the command line. The command-line interface (CLI) is necessary for integration with both the Oracle Fusion Middleware installer and Enterprise Manager during application deployment. Additionally, you can use the CLI in cases where Xserver is not configured or if you are using a telnet terminal that does not have proper display capabilities. This topic lists and describes the RCU modes available from the command line. Run RCU with minimal or no interaction from the command line. For more information, see Using the -silent Command. Run the RCU graphical interface. This is the default if neither -silent nor -interactive is specified. This command (whether specified or not) allows you to pre-populate certain screens with information as specified from the response file or from the command line. You can pre-populate the Create Repository and Database Connection Details screens. For more information, see Using the -interactive Command. This topic lists and describes the RCU operations available from the command line. Run RCU with -silent to generate a RCU response file that contains all valid RCU command line parameters. Run RCU with either -silent or -interactive to perform a RCU operation using a response file. Run RCU with either -silent or -interactive to create a repository. For more information, see Creating a Repository from the Command Line. Run RCU with either -silent or -interactive to generate a script for system load. For more information, see Generating a System Load Script From the Command Line. Run RCU with either -silent or -interactive to load data into the repository. For more information, see Loading Data Into the Repository From the Command Line. Run RCU with either -silent or -interactive to drop a repository. For more information, see Dropping a Repository from the Command Line. Run RCU with -silent to generate a list of components for a given Oracle home. This topic lists and describes the various command line parameters. These parameters can be passed to RCU as input by directly entering the parameters on the command line or by using a response file. Full path to the location of the ComponentInfo.xml file. The default location is ORACLE_HOME/oracle_common/rcu/config (on UNIX operating systems) or ORACLE_HOME\oracle_common\rcu\config (on Windows operating systems). Full path to the location of the StorageInfo.xml file. The default location is ORACLE_HOME/oracle_common/rcu/config (on UNIX operating systems) or ORACLE_HOME\oracle_common\rcu\config (on Windows operating systems). Type of database to which you are connecting. If you are performing the system load and product load concurrently as a user with full DBA privileges, the valid options are ORACLE, SQLSERVER, IBMBD2, MYSQL, or EBR. If you do not have permissions to perform system load and product load concurrently and need to generate a script, you can only use the ORACLE and EBR database types. For more information about system load and product load, see Understanding System Load and Product Load. Credentials for connecting to your database. Edition name. This is only valid if you specify databaseType=EBR. Database user name (for example, the default user name on Oracle databases is SYS). This parameter is required if the —createWallet parameter is provided during the -generateResponseFile operation. RCU uses the database user name as the key/alias to store the database user password when generating wallet. If the —createWallet parameter is not provided, the database user name is optional. 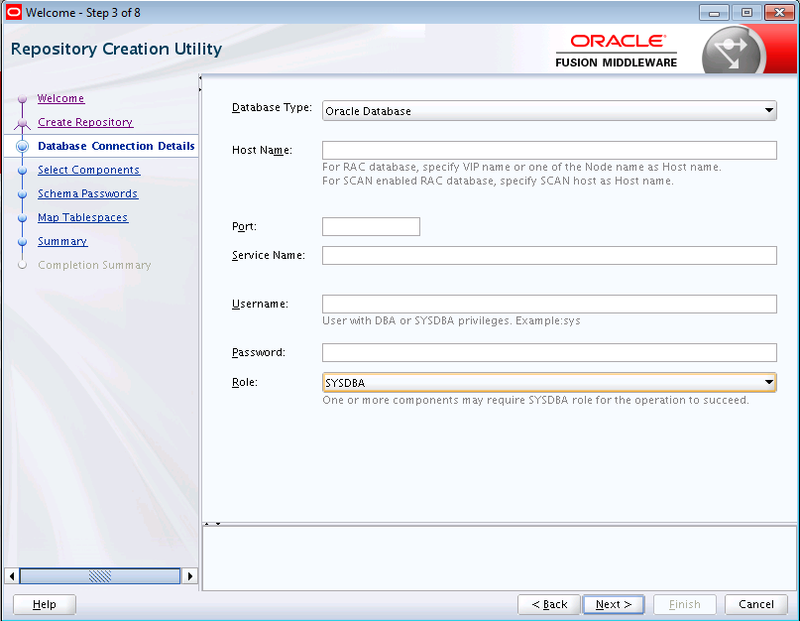 Database user role (for example, SYSDBA for the SYS user on Oracle databases). Specify Yes or No for unicode support. Default is Yes. This is only valid if you specify databaseType=SQLSERVER. Whether or not you want to skip the schema cleanup if schema creation fails. Valid values are Yes or No. The default is No. Specify the location to save the generated script for system load repository. Whether or not you want to use the same password for all schemas. Valid values are true or false. The default is false. Whether or not you want to have RCU automatically select dependent schemas for your components. Valid values are true or false. The default is false. If value is set to true, RCU creates datafiles using Oracle-Managed Files (OMF) naming format. Valid values are true or false. The default is false. Whether or not you want to encrypt all new tablespaces that will be created by RCU. This option is valid only if you have TDE (Transparent Data Encryption) enabled in the database (Oracle or Oracle EBR) when you start RCU. TDE tablespace encryption allows you to encrypt sensitive data stored in tablespaces. Valid values are true or false. The default is false. If value is set to true, all new tablespaces created by RCU will be encrypted only if TDE is enabled in the database. Tablespaces that were created before RCU was launched cannot be encrypted using this option. This parameter allows you to skip dropping tablespaces during the -dropRepository operation. Valid values are Yes or No. Specify Yes to skip tablespace drop. The default is No. Comma separated variables in the format variablename=value. See RCU Environment Variables for a list of RCU environment variables. Prefix for your schemas. For more information about schema prefixes, refer to Planning Your Schema Creation and Select Components (for Create Operation). This parameter is required if the —createWallet parameter is provided during the -generateResponseFile operation. RCU uses the prefixed schema name as the key/alias to store schema passwords when generating wallet. If the —createWallet parameter is not provided, the schema prefix is optional. Tablespace name of the component. This tablespace must exist in the database if you are using this option. TEMP tablespace name of the component. This tablespace must exist in the database if you are using this option. Provide this parameter if you want to create a wallet file to securely store your RCU passwords, such as the database user password, schema passwords, and custom variable passwords. RCU accepts password credentials stored in an Oracle Wallet. That is, you can use the generated wallet later in silent situations to provide your passwords to RCU without having to directly enter passwords on the command line. The wallet will be generated in the same directory as the response file. Absolute path of wallet directory where your RCU passwords used for creating or dropping schemas are stored. If you choose to use a wallet to provide passwords to RCU, RCU will retrieve the required passwords from the specified directory. This option is valid for silent mode only. The wallet must already exist and contain the required passwords if you are using this option. If the wallet does not contain the required passwords, RCU will prompt you for the missing passwords on the command line. This directory should contain a valid cwallet.sso file. RCU supports auto-login wallets only (password is not needed to open wallet). Absolute path of RCU response file directory. If specified, RCU generates a response file named rcuResponseFile.properties in the given directory. If not specified, RCU generates a response file in the $HOME/.rcu directory by default. Comma-separated list of component IDs for the components in the Oracle home that you want to add to the response file. To generate a list of valid component IDs for a specific Oracle home, see Generating a List of Components in an Oracle Home from the Command Line. If not specified, all valid components in the Oracle home will be added to the response file by default. Specify -silent if you want to run RCU with minimal interaction once you have entered the command. In this scenario, RCU will prompt you for the database and component schema passwords from the command line. If you specify multiple components, you will be prompted for the passwords in the order in which the components are specified. Instead of directly entering all the RCU parameters on the command line, you can provide the location and name of a file containing certain input values. This file (called a response file) allows you to provide values for all valid RCU command-line parameters to RCU via a text file. When you run RCU, all values will be read from the response file to create or drop schemas. For more information, see Using Response Files. It is important to make sure that the passwords in the file are specified in the same order as the components on the command line. Once the installation is complete the password file must be removed. The passwords are maintained in cleartext format and therefore present a security risk if the password file is left in place after installation. Instead of using a plain text password file, you can create an Oracle Wallet file containing all the necessary passwords and then use the -walletDir parameter to pass this file to RCU. For more information, see Using a Wallet to Store Passwords. If you are running RCU from the command line, password credentials (for example, schema passwords) can be stored and provided to RCU in an Oracle Wallet file. When you run RCU from the command line, RCU prompts you to enter values for any required passwords by default. To avoid entering passwords on the command line, you can create a wallet file to securely store and encrypt any necessary passwords. You can then pass the wallet to RCU by providing the wallet location with the walletDir parameter. To create a wallet using the RCU graphical interface, see Creating a RCU Response File from the Graphical Interface. To create a wallet using the RCU command line interface, see Creating a RCU Response File from the Command Line. Once the wallet is created, this file can be reused to store and provide passwords for multiple sessions. Note that RCU only supports auto-login wallets (no password is needed to open a wallet). Password-protected wallets are not supported. When the wallet is generated by RCU, RCU uses the prefixed schema name as the key/alias for storing schema passwords, which allows you to more easily reuse the same wallet for multiple sessions. For database user password, the alias is the database user name (for example, SYS). If the same password is used for all the schemas, then RCU uses the alias prefix_COMMON_SCHEMA_PASSWORD to save the password in the wallet. After the wallet is created and contains the necessary passwords, use the —walletDir parameter to pass this file to RCU so that you do not have to directly enter your passwords on the command line. Alternatively, the wallet location can be provided to RCU via a response file. In this example, the wallet should contain passwords for the database user (sys), the Metadata Services (MDS) schema, and the Service Table (STB) schema. If a wallet does not contain all the necessary passwords, you will be prompted to enter the missing passwords on the command line. Specify -interactive to run the RCU graphical interface. This is the default if neither -silent nor -interactive is specified. When you run the RCU graphical interface, you can provide the location and name of a file (called a response file) containing certain input values (for example, database connection details). These are the values that are asked for during a typical session using the graphical interface. The values you enter in the response file can be used to populate certain RCU screens. For more information, see Using Response Files. Before running RCU, you can provide information that is required to perform a specific RCU operation in a response file. For example, you can provide your database connection details, a list of components to be added or dropped, and the schema prefix to RCU via a response file. A response file can be used to automate a RCU session. When you run RCU using a response file, RCU reads the information provided in the response file to complete the RCU operation. A response file is a properties file in which all RCU command-line parameters can be provided as input to RCU to perform a RCU operation. Rather than directly entering the RCU Command Line Parameters on the command line, you can provide values for these parameters to RCU via a text file. This file can be generated from the RCU graphical interface (using the values you provide in the RCU screens) or from the command line. After you create the response file, the parameters can be modified in a text editor or be used exactly as-is to perform a RCU operation at a later time. If you choose to run RCU from the command line with a response file, the values you specify in the response file are the values for the RCU parameters that you would normally provide on the command line during a typical silent RCU session. If you choose to run the RCU graphical interface with a response file, the values you specify in the response file are used to pre-populate the fields on certain screens. The Save Response File option on the Summary (for Create Operation) or the Summary (for Drop Operation) screen saves the information you provide in the RCU screens to a response file. After you click the Save Response File option, you will be prompted to specify a location for where you want to create this file. By default, RCU saves the response file in the $HOME/.rcu directory. Because the response file needs to contain password information, RCU provides the Save Passwords in Wallet option to securely store and encrypt any passwords you provide on the RCU screens in a wallet. You can use the wallet later in silent situations to provide the necessary passwords to RCU so that you do not have to directly enter your passwords on the command line. When you run RCU from the command line, the wallet location can be provided to RCU on the command line or using a response file. If a wallet directory is not provided to RCU, you will be prompted for the required passwords. This topic shows the full syntax for the RCU command line interface to generate a RCU response file. If the —createWallet parameter is provided, then values for —dbUser and —schemaPrefix are required. Otherwise, the —dbUser and —schemaPrefix parameters are optional. RCU uses the prefixed schema name and the database user name as the key/alias to store schema passwords and the database user password in the wallet, respectively. If you provide —createWallet and —useSamePasswordForAllSchemaUsers true on the command line, then all schema passwords will be set to the same value in wallet. If the —createWallet parameter is provided, RCU will prompt you to enter a value for each password that will be stored in the wallet. In this example, a response file and wallet are created in the /home/exampleuser/rcu directory, and the information provided on the command line (such as the list of components) is added to the response file. This topic shows the full syntax for the RCU command line interface to perform a RCU operation using a response file. You use a response file to provide input to RCU to automate a RCU operation from the command line or from the graphical interface. If you choose to run the graphical interface with a response file, RCU will pre-populate certain RCU screens (such as the Database Connection Details screen) based on the input values you provide in the response file. If you choose to run RCU from the command line, you can use a response file to provide values for all valid RCU parameters rather than directly entering these parameters on the command line. If you provide a value for a parameter on the command line and in the response file, RCU will use the value provided on the command line. Before running RCU, ensure that you have provided the required information in the response file. If some of the mandatory properties in the response file are missing values when you run RCU, RCU will notify you and exit. For connecting to certain databases (for example, SQL Server), the dbRole parameter is not normally required when you run RCU. However, when a RCU response file is generated, the dbRole parameter is marked as required in the response file by default. As a result, if you are using a response file, the dbRole field must not be left blank even if the database role is not required to connect to a database like SQL Server. This topic shows the full syntax for the RCU command line interface to create a repository. In order to work properly, make sure that the parameters are specified in the same order that they are listed. For example, do not specify the -compInfoXMLLocation parameter after the -component parameter. When specifying the -component, you must use the correct component IDs, which are listed in Understanding Repository Creation Utility Schemas, IDs, and Tablespaces. Before you create any schemas, you must be aware of and specify all dependencies for the component you are loading. For example, the SOAINFRA schema depends on the MDS and ORASDPM schemas; if you try to load the SOAINFRA schema without specifying both the MDS and ORASDPM schemas, or if the MDS and ORASDPM schemas do not already exist in the database, RCU will stop before any loading takes place. This topic shows the full syntax for the RCU command line interface to generate a system load script. Before you create a script, you must be aware of and specify all component dependencies. For example, the SOAINFRA schema depends on the MDS and ORASDPM schemas; if you specify the SOAINFRA schema without specifying both the MDS and ORASDPM schemas, or if the MDS and ORASDPM schemas do not already exist in the database, RCU will stop before competing the operation. This topic shows the full syntax for the RCU command line interface to load data into a repository. This topic shows the full syntax for the RCU command line interface to drop a repository. You must also be aware of schema dependencies when dropping schemas (see Understanding Repository Creation Utility Schemas, IDs, and Tablespaces). For example, several schemas require the MDS schema to be present; if you choose to drop the MDS schema, then all the schemas that require the MDS schema will stop working. This topic shows the full syntax for the RCU command line interface to generate a list of valid components that are available in a given Oracle home. This command displays the name, component ID, and the supported database types for each component that is available in the Oracle home in which RCU was started. The Component ID and database type are the values you must specify with the -component and —databaseType parameters, respectively, when you run RCU from the command line. Table 3-4 shows the variables picked up by RCU from the environment. If the environment variable is not set, then RCU uses the default value. Location of the RCU log file. Determines whether or not a directory with the format logdir.yyyy-dd_hh-mm is created for the RCU log file. Set this variable to true or false. Name of the RCU log file. Determines the RCU log level. Set this variable to one of SEVERE, ERROR, NOTIFICATION, or TRACE. Set this variable to any Java Virtual Machine (JVM) argument.